Applications open for Dreamit UrbanTech until June 23rd – Apply Now! Dreamit Ventures, a renowned accelerator program topping the entrepreneurial ecosystem, is expanding its successful accelerator with a new program focused on Urban Tech. Dreamit has launched over 300 companies that have raised $500 million in funding and have a combined valuation of more than $2 billion. Dreamit UrbanTech invests in and nurtures startups that solve issues for urban areas and that impact the built environment. This includes startups in real estate tech, smart cities, energy efficiency, construction tech, and transportation. The United Nations estimates that nearly 65 percent of the world’s population will call cities home by 2040. Smart city technology is no longer a luxury for cities but a necessary investment to make cities livable and manage the forces of urbanization. In 2017, we crossed the tipping point, where more people live in cities than any other setting. Although 62.7% of the US population lives in a city, cities only occupy 3.5% of the total land mass. This presents an unprecedented opportunity for savvy entrepreneurs to build products to solve issues like energy efficiency, connectivity, and access to affordable housing. APPLY NOW to Dreamit’ Urban Tech Accelerator to capture a piece of this opportunity. 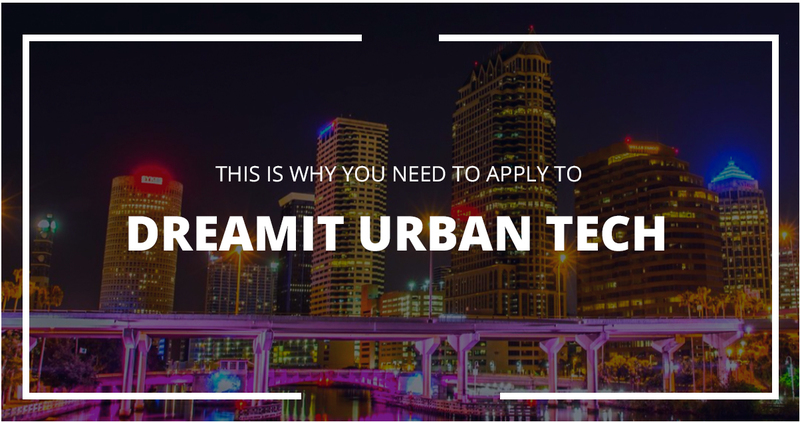 To bring this to life for a growing ecosystem of urban tech startups, Dreamit has partnered with Jeff Vinik, owner of the Tampa Bay Lightning whose vision is driving the redevelopment of downtown Tampa. His company, Strategic Property Partners, a joint venture with Bill Gates’ Cascade Investment is leading the redevelopment project. The joint program allows the accelerator to combine the operational startup acumen of Dreamit with the expertise and resources of Jeff Vinik and his team. Strategic Property Partners (SPP) has laid out a vision to build the future of southern downtown Tampa: a connected, urban, multi-use project on the waterfront. The development project includes a total 9,000,000 square feet of residential, retail, commercial and entertainment spaces built from the ground up – with a committed investment of over $3 billion to turn this vision into a reality. Startups in the program will have the opportunity to interface with SPP as they begin to map out the new downtown Tampa and have the potential to see their solutions implemented in a real world setting in one of the largest real estate projects in the US. The potential to scale your solution into a project of this magnitude is real validation. Like the other Dreamit programs, during the program’s entire duration, startups will have weekly meetings with Dreamit’s managing directors to work through all aspects of their business: developing the go-to-market strategy, testing ideas and proving or dismantling critical assumptions. Dreamit takes admitted companies on “customer immersion” roadshows, forgoing traditional demo days that engage investors and journalists on a top-line level with three-minute pitches for deeper-dive meetings with potential pilot clients, sector-specific investors and potential acquisition companies. 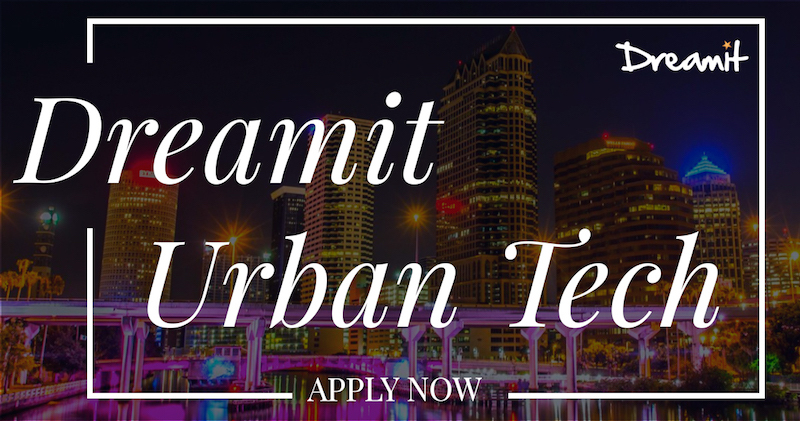 Dreamit UrbanTech is now calling for companies to apply today before applications close on 6/23. The accelerator is a 14-week program designed to help startups scale their business through a network of large enterprise customers including construction firms, real estate developers, property managers, and other contractors critical to building the cities of the future. Dreamit consistently ranks as one of the top 10 global accelerators and has a reputation for building deep customer networks in the fields of health tech, education tech, and, most recently, urban technologies. 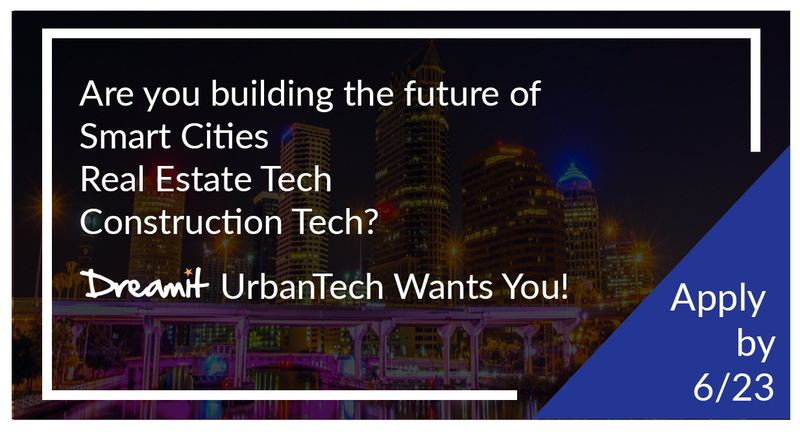 Dreamit UrbanTech is now open for startups to apply that have a value proposition in the sectors of real estate tech, construction tech, and smart city solutions. UrbanTech can be outlined as follows and you will see that it is wide net. After all, when building the cities of the future, there are a lot of moving parts. Real Estate Tech: Software as a service and other types of technology companies that enable real estate transactions, the management of real estate properties, and other common real estate services. Construction Tech: Tools that help in executing any construction project from design to completion. Includes latest building technologies like 3D printing, robotics and modular construction that reduce the dependency on human labor and execute projects in shorter time span.